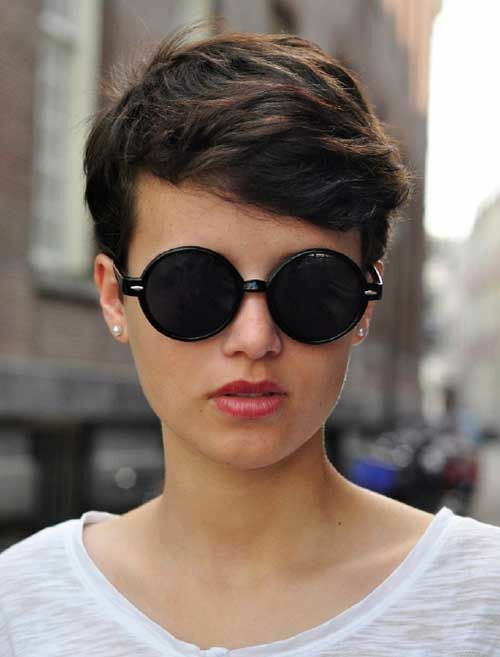 Flirty, quirky, feminine and fashionable, this season’s fabulously fresh pixie cuts are a hot trend! 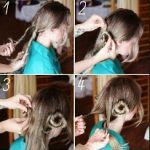 Oval faces are considered the most perfectly balanced face shape and this means all hairstyles suit you. So it’s up to you to choose a hairstyle that meets your style and care requirements. That sounds wonderful, but may leave you in an agony of indecision! 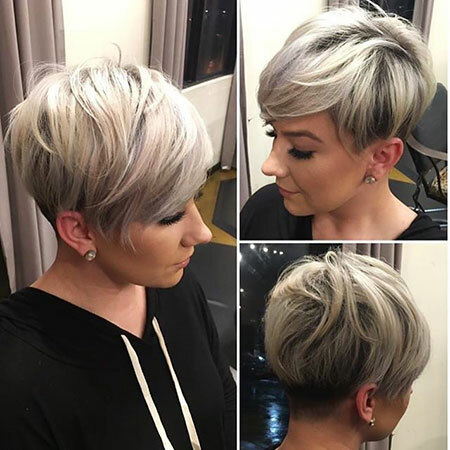 For sheer versatility, these new short haircuts and color trends will take you anywhere in style! And you won’t waste your valuable time and money on styling! 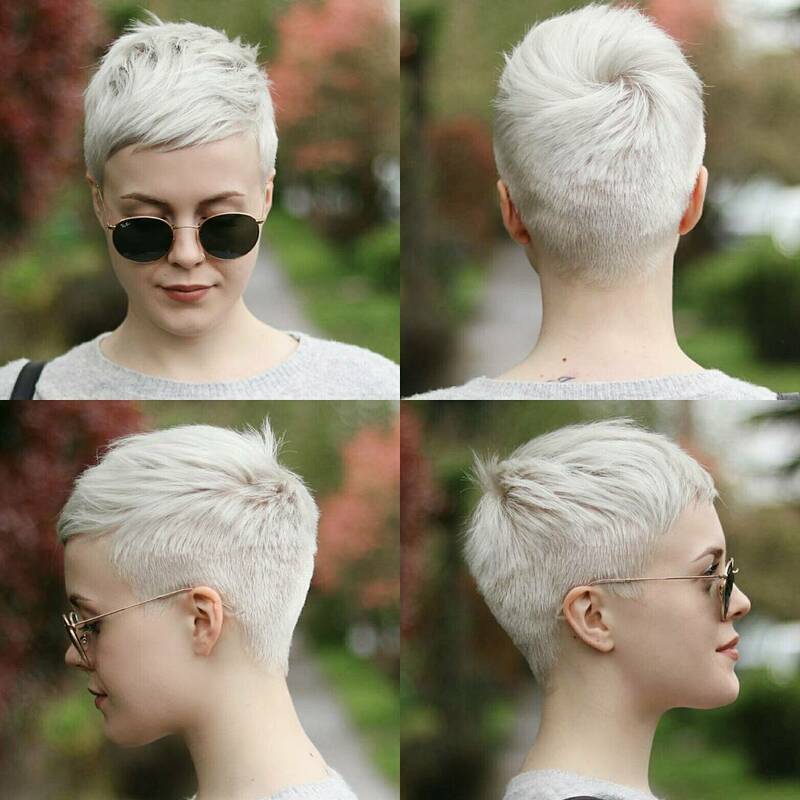 With a little black dress for a drinks’ party, or a warm sweater for a day spent outdoors, this baby-blonde pixie cut has lots of personality. Short, blonde urban haircuts with dark roots can be too edgy for a softly sophisticated gal. But this trendy combed-forward cut looks as soft and light as gossamer and just needs a slick of clear red lipstick to add a touch of color! 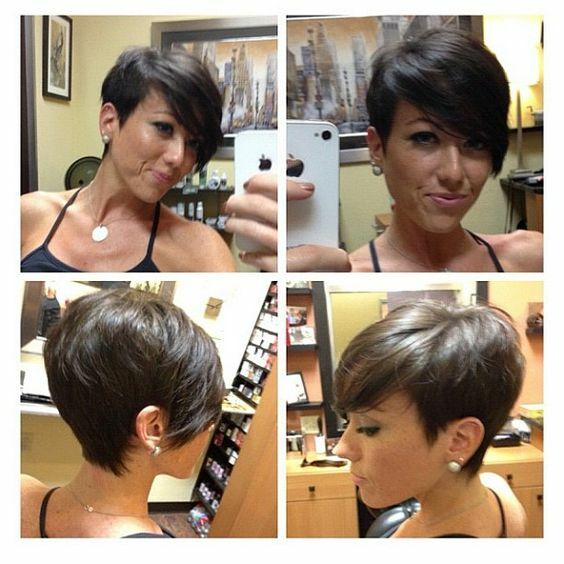 This classic asymmetrical pixie is the perfect easy-care/fashion cut for medium to thick straight hair. As you can see in the style above and this image, keeping your hair short at the sides really brings out eye-color in a flattering way. 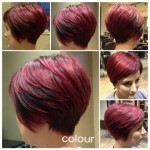 This is one of the most popular asymmetrical cuts ever, as it can be adjusted and styled to suit most face shapes. And it suits girls and women, (however mature), of all ages! The youngest fashion fans are always the first to wear each new trend and make the rest of us feel positively old-fashioned! 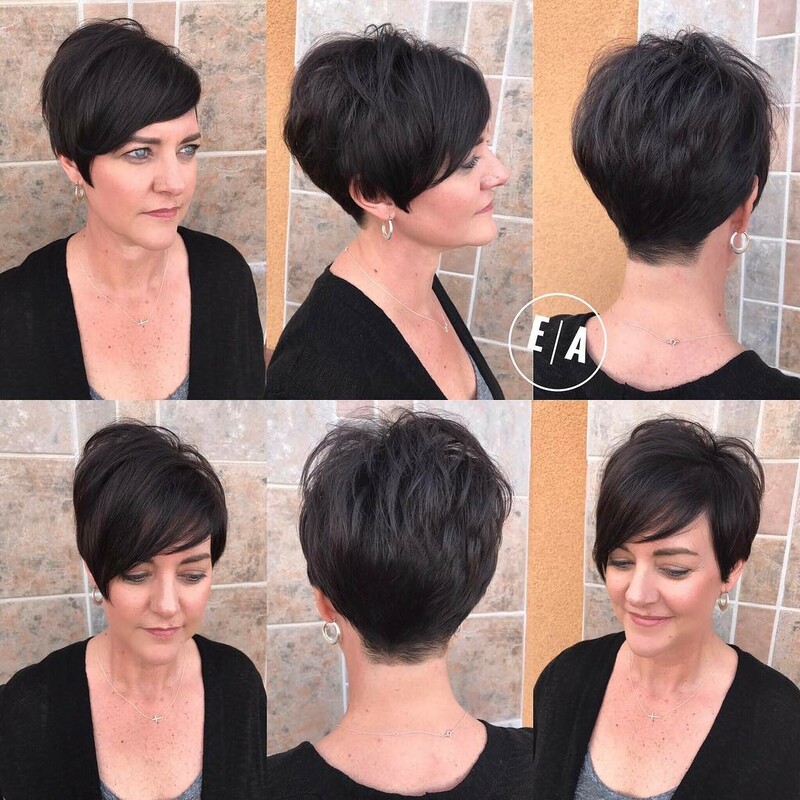 This model has lots of edgy cutting features added to her asymmetrical pixie cut like the shaved line and ragged finish at the nape. But the lovely purple-ash color adds another layer to the asymmetry, giving a glamorous look that highlights her green eyes perfectly! If you love the sleek style of a stacked-back bob, but don’t have thick hair, this is how to get a very similar shape on fine hair. 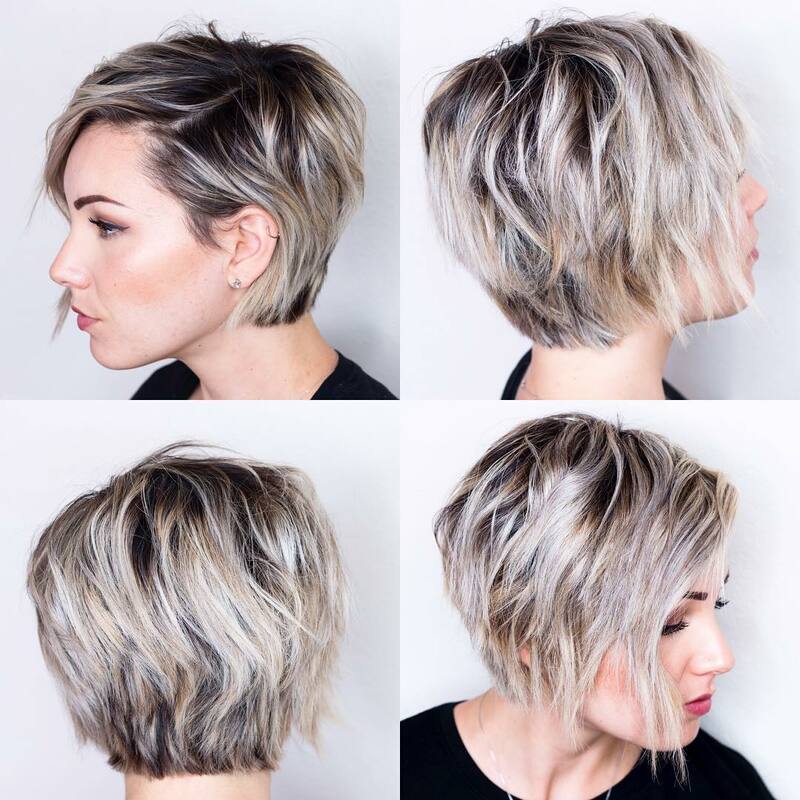 The back is buzzed short and the longer lengths above are highlighted with fashionable ash-blonde. This helps create the illusion of a stacked back and moves the volume-focus up to the crown. 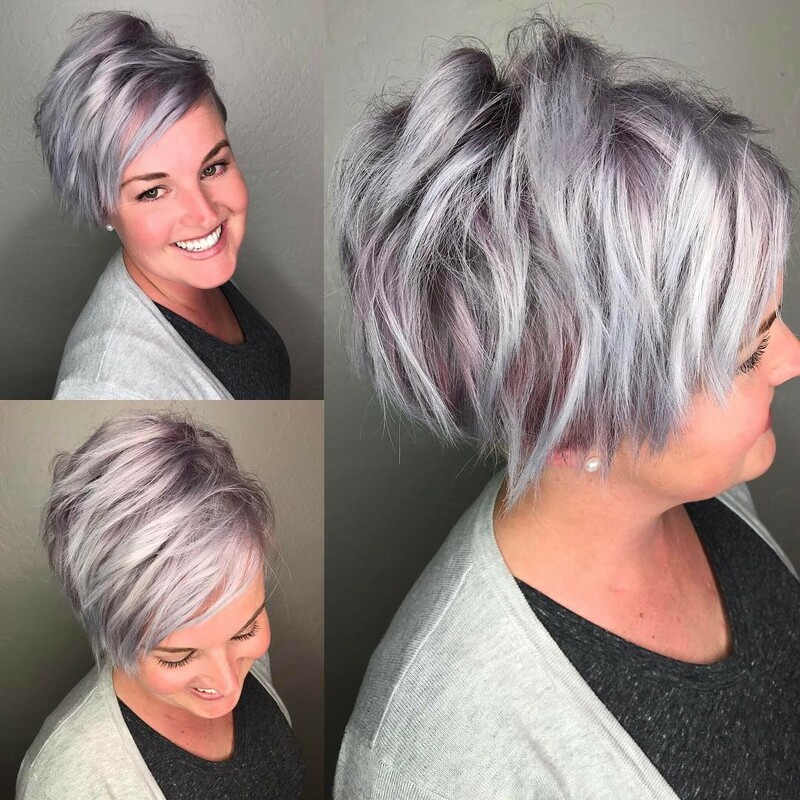 The color-contrast adds depth and a super-cute touch of lavender in the fringe completes this pretty pixie style! No wonder this model is flashing a mischievous (cheeky) grin – she knows her pink and silver-blonde look is going to make everyone do a huge double-take! 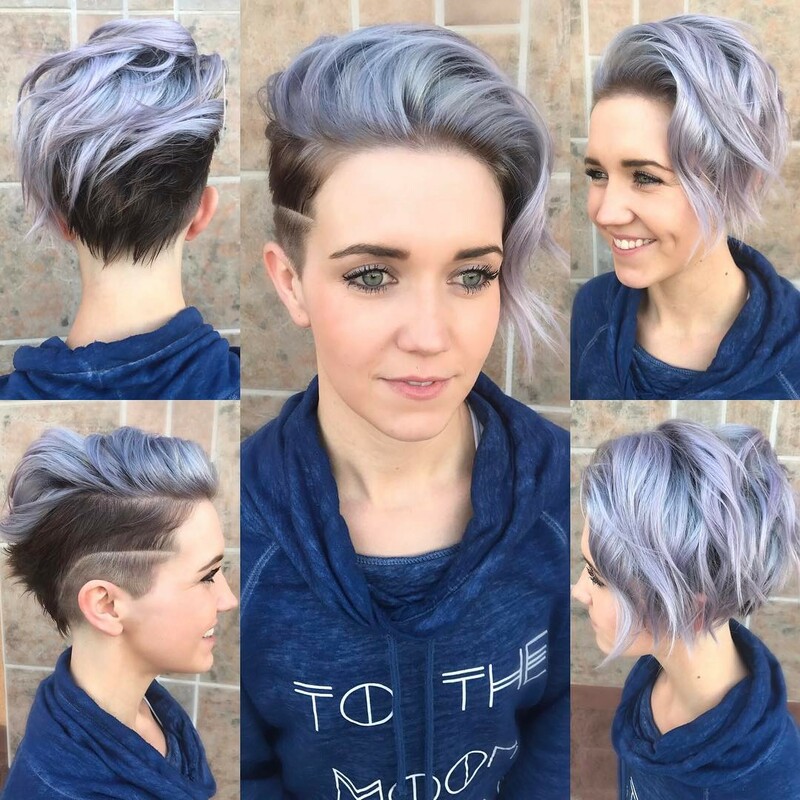 This cute, futuristic pixie is a great new way to wear medium to thick hair. Long, twisted tresses create flattering height and the 3-D texture is amazing. Start the day with a trendy, messy look – and you won’t waste a second checking your hair in the mirror! 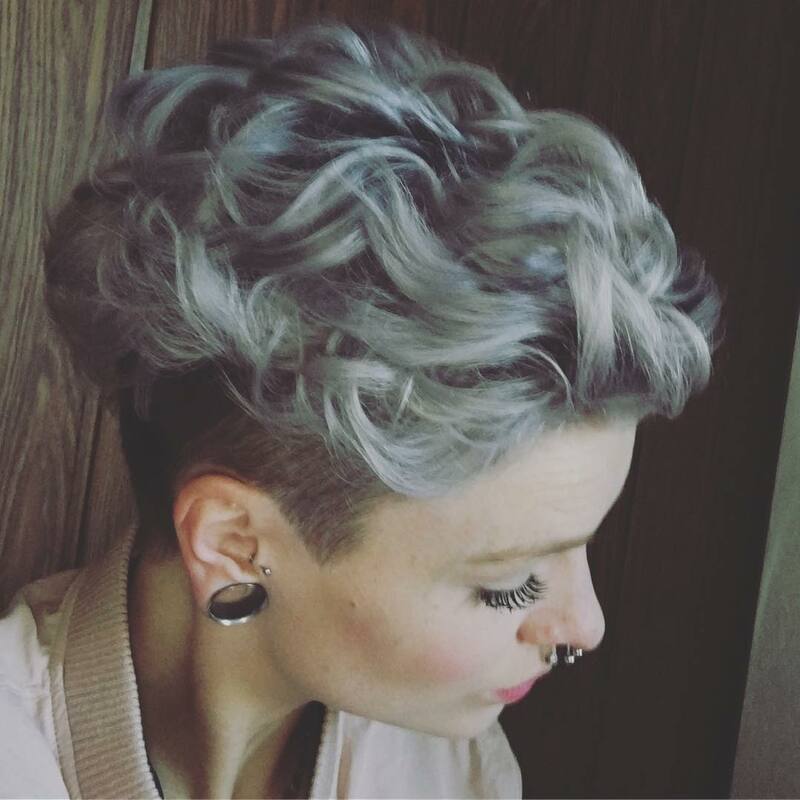 This longer pixie demonstrates the fabulous texture you can achieve on fine hair. Dark roots are cleverly highlighted with several shades of blonde – including golden, beige and white – to make a high-fashion 3-D finish. The look has a messy finish and this multi-blonde technique doesn’t need expensive ‘touching-up’ every month, so it’s easy to maintain! Ash-blonde and ash-brown shades are really popular this year. 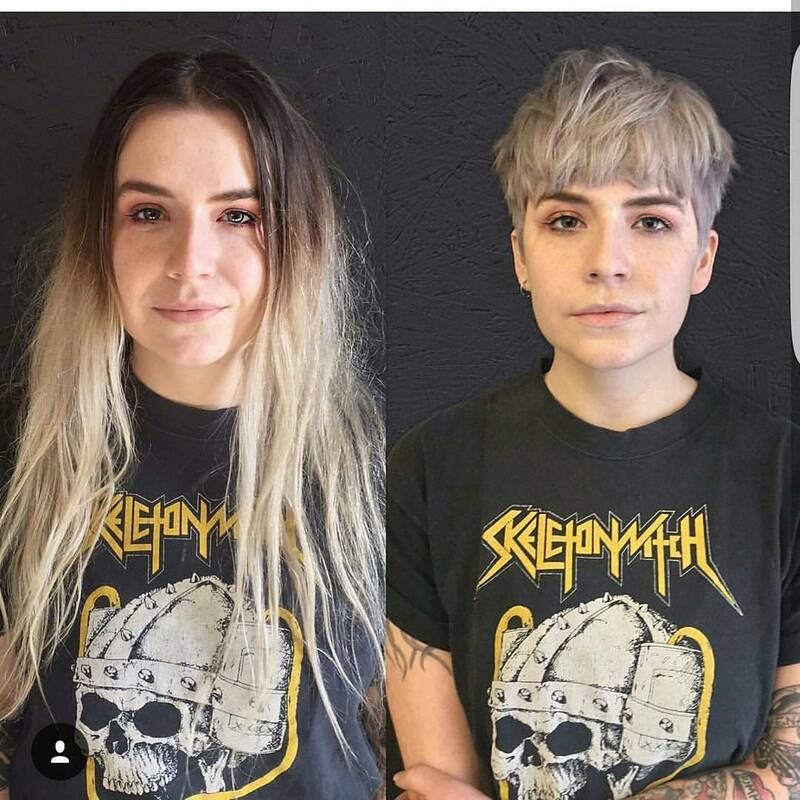 For anyone with non-descript mousey or dark-blonde hair, switching to an ash-shade is a super way to get a chic look that’s easy to maintain. 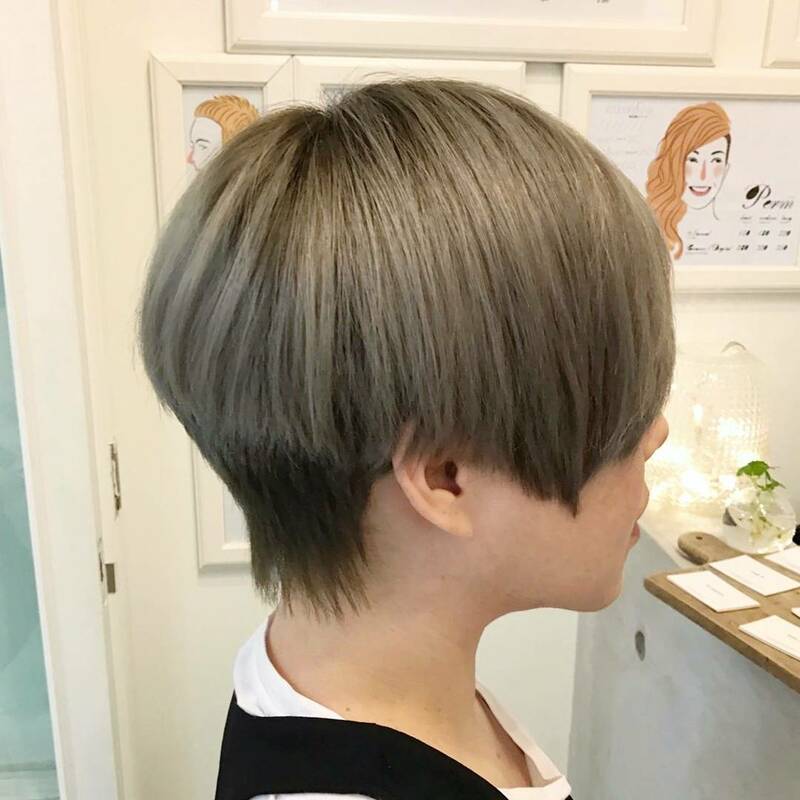 This long pixie has edgy texturing along the nape and layers accentuated with dark-brown underneath a smooth, medium ash-blonde top. Great new look for fine to medium hair types! 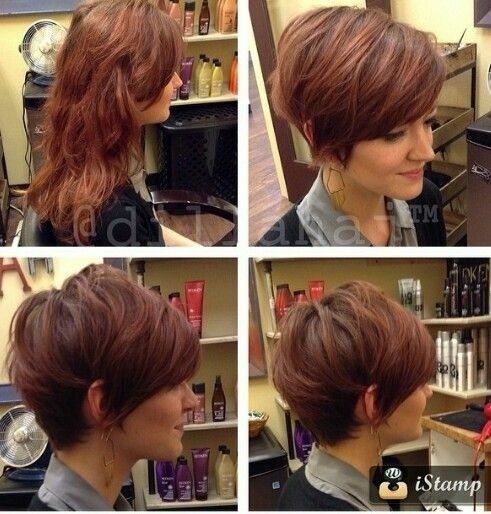 The short pixie cut is always a super-modern look, giving you a ‘blank canvas’ to play around with. It’s so simple to gel into a sleek quiff for sophisticated evening style, spiked up high for a casual boyish look, curled or with this natural, swept-forward finish. 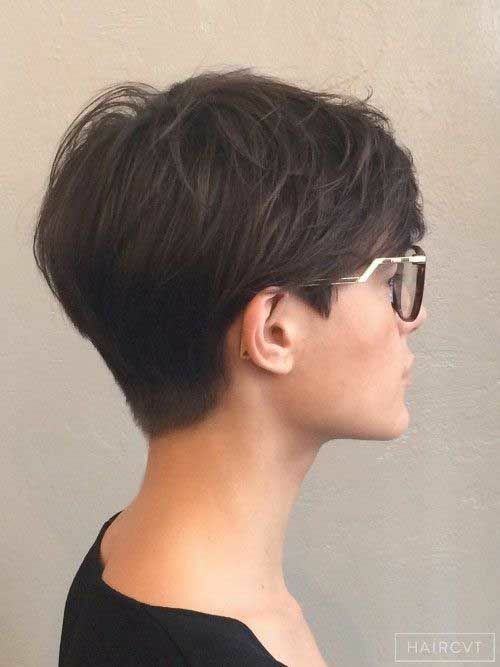 The layers on this fresh pixie are blunt cut to create a soft pattern around the head. Cute, short pixies suit fine hair and save hours of styling time! This edgy look contrasts the clean-cut, buzzed sides and back with some very exciting movement around the top of the head! The sides are quite boyish, but the beautifully flowing ripple-waves along the top show a feminine softness. The hair color changes brunette hair to a highly modern blonde shade with strong ash, white and sea-green tones. 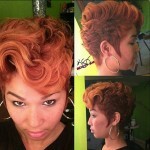 Perfect for complementing this model’s unconventional style! There’s no harm in smartening up your style to create a good impression at work, or whatever reason. The point is that you don’t have to lose your preferred fashion style in the process. 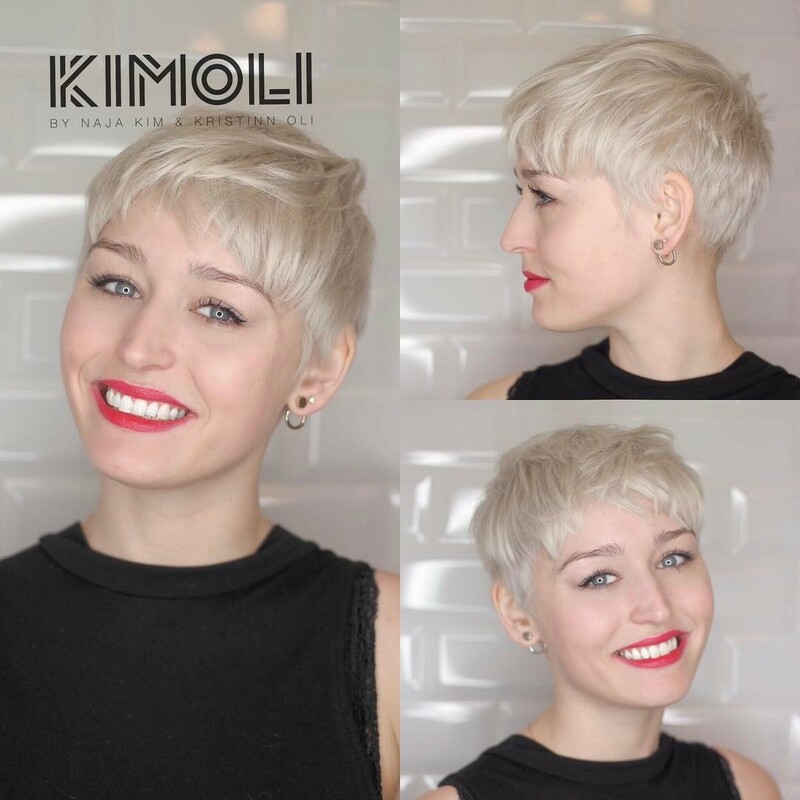 This model identifies as a rock-chick, but with a chic, modern bowl-cut she can vary her style to suit any occasion! And the ash-blonde color with a hint of purple still keeps her style edgy!